Lord Browne, the former chief executive of BP, knows all about fraught relationships with the government and the public. His new oil business, Letter One, fell foul of official intervention earlier this year when the then energy secretary, Ed Davey, blocked the purchase of 12 North Sea gas fields. Letter One, of which Lord Browne is executive chairman, is backed by Mikhail Fridman, a Russian billionaire. The government was concerned that sanctions against Russia over the conflict in Ukraine could affect the operations of the North Sea fields. At first, Letter One said it would fight the ruling. But, Lord Browne tells me, they have now decided that good relations with governments - any governments - are more important than technical battles over legal rights. Letter One has now agreed to sell the North Sea fields. "Whether we agree with [the government's decision] or not, they are the government, we want to have good relationships with them and we need to know our place in the world and we do," he tells me. Lord Browne is making a wider point. Businesses, he argues, should better understand that their role is to serve society. His new book, Connect, says that only by rethinking how they engage with society can businesses hope to tackle the collapse in public trust that followed the financial crisis. If they don't, Lord Browne warns, the precarious relationship between wider society and the business community can only deteriorate. "It is more and more dangerous," he says of the present situation. "But life goes on at a far faster rate than it used to, companies can disappear when their reservoir of trust is depleted, companies can be wounded many, many times over. "Getting it right is more important now because the information moves very quickly around the world. "The single most important thing is [that businesses] know what their role is. "Businesses aren't governments, businesses aren't people who should push others around. "Businesses are there to co-operate, to work with society. Businesses have to be engaged very radically with everybody who is affected by them - [and] tell the truth." In his book, Lord Browne says that many business leaders understand that they need to take a different approach, but still do not change. The grind of quarterly reporting means it is easier to carry on with business as usual - and slap the false gloss of "corporate social responsibility" on top. You can, of course, put lipstick on a pig, but it's still a pig. "One of the props that people have relied upon is corporate social responsibility, and that's allowed a lot of companies to detach the activity of communicating and being involved with stakeholders almost into a side-pocket," Lord Browne says. "And saying: it's all very nice and meanwhile we'll carry on the business in the way we've always done it. "We have to integrate those two things, and that's why I think CSR, while it had some interesting positive effects early on, has I think become a rather negative problem, which takes away the substance of being involved with your stakeholders." So, is it time to retire those worthy tomes printed on recycled paper and call an end to CSR? "It should be dead," Lord Browne replies, laughing. He argues that up to 30% of a company's value "could be at risk" if it fails to engage properly with the public. "This is not just to go 'hug another person' or say nice things. It is actually to do the business better. And by doing this well you can actually make more money," he says. Now, Lord Browne was a very highly paid executive when he led BP. And many argue that multi-million pound pay packages for chief executives at a time when many people are struggling through an era of low or even negative wage inflation make it difficult for public trust to be regained. 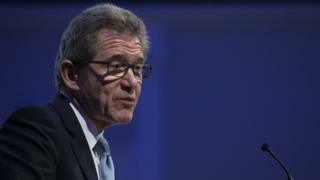 On executive pay, Lord Browne says: "things need to be made simple and explained better and the level needs to be thought through as fit and proper for the job". "A lot of people don't begrudge large amounts of money for people who create something themselves," he argues. "The public recognise that if you create something you should be rewarded for it. Being in a position where you just rise with the tide, then it gets a very negative result." I ask Lord Browne about the oil price and its effect on the North Sea. He says that a long career in the sector makes him wary of making any predictions, but at the moment the low-price cycle appears to be here to say. "The fact is there is an awful lot of oil around - the revolution of technology that produced a lot of light, tight oil - so-called shale oil - in the US, the coming back into the world markets of Iran and Opec's determination to keep producing at maximum rate. "Equally, demand is relatively weak. So, this is not a one-minute wonder. It will take a few years to come back into balance." And that makes business in the North Sea ever harder? "The North Sea is a very high-cost producing area, so the lower the price the worse the future," Lord Browne says. "There is less margin available and more money needs to be set aside to abandon all the old facilities and pipelines that are no longer needed, so it is not a very attractive place to do business. "But equally I would say this. When the North Sea started in the mid-seventies its lifetime was determined as 25 years. "So, we are 15 years into overtime at the moment and that is a pretty good run."